This type of injunctive relief may be either temporary or permanent. For the person accused of domestic violence in Fort Lauderdale, an injunction is yet another way actions and movements can be restricted following an allegation or arrest. It’s an extremely serious issue, and it can have major repercussions in divorce cases and child custody and parenting time. When requested by the alleged victim, it’s free, quick to file, and can give a significant tactical advantage to the filing party. That’s why it’s so imperative for the accused to hire a dedicated law firm as soon as receiving notification of a temporary order. One mistake people make is thinking, “Maybe it’s not so bad if we spend some time apart.” That may indeed be true, but an injunction is a public, legal document. That means it can be seen by anyone who wishes to scan your record – including employers, universities and other family members. It can reflect negatively on your character, even when the actual circumstances behind the filing are nuanced and complex. Although the methods below detail civil requests for injunction, they may also be requested by prosecutors on behalf of the alleged victim in a criminal case. A cause of action for a domestic violence injunction is outlined in Chapter 741 of Florida Statutes and is the exclusive civil method through which to obtain a protection against domestic violence. This type of injunction is available to family or household members, and may be filed in the circuit where the petitioner currently or temporarily lives, where the respondent lives or where the alleged act of domestic violence happened. The reason for this is to allow a person who has fled a dangerous home situation to obtain a protection order without having to return to a potentially perilous site. In order to grant a temporary order of protection, the judge must find: Petitioner has been a victim of domestic violence or has reasonable fear of imminent violence. The law is clear that two parties can’t have “mutual injunctions.” That means if respondent wants to counter with his or her own requests for protection, it has to be filed totally separately, under a separate case number, to be considered on its own merits. Dating violence injunctions are a fairly new concept, established by the Florida legislature in 2002. Any person who is the victim of dating violence or the parent, legal guardian of a minor child living at home who is the victim of dating violence, can seek protection under this section. This type of violence is defined as between individuals who have or previously had a romantic or intimate relationship. Usually, the court will look at whether the relationship has existed for the last six months, whether it was characterized by the expectation of affection or sexual involvement and the type and frequency of interaction on a continuing basis. Casual acquaintances would not qualify. Also fairly new is the sexual violence injunction, which became available in Florida in 2003 under the “Victim’s Freedom Act.” In order for this injunction to be obtained, a petitioner has to show an incident of sexual violence or molestation has been reported to laws enforcement and petitioner is cooperating in any criminal proceeding against the respondent. Alternatively, a petitioner/victim can seek an injunction for protection under this provision if respondent was convicted and sentenced to incarceration for sexual violence and the sentence either expired or is due to expire in the next three months. Most domestic violence injunctions will include the standard requirement to have no contact with the accuser and to stay at least 500 feet away from him or her. Additionally, most orders will grant accuser exclusive use of a shared residence. This is often in direct conflict with the name on the title. So it doesn’t matter if the home is in your name. You can be ordered to stay away from it. In these cases, the court should grant you the opportunity to retrieve your personal effects, work equipment and any other items the parties agree on in court. Police will likely be present through this process, and you may only be given a half-hour window. The court doesn’t have any discretion to grant equitable division of property, the way a judge presiding over a divorce would. So all property disputes have to be handled through a separate court. Defendant may also be ordered to stay away from accuser’s home (if different than shared residence), workplace, school or other place designated by petitioner. Defendant can also be ordered to temporarily surrender all guns and ammunition and may also lose custody or parenting time with children. These injunctions are enforceable in all counties throughout the state, as well as nationwide. Be mindful also that violation of an injunction can have serious penalties, including jail time. So if you are accused of violating the terms of a protection order in Florida, hire an attorney immediately if you don’t already have one. 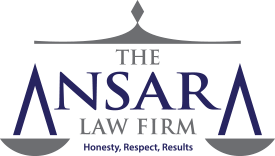 If you have been the subject of a request for injunction or protection order in South Florida, call The Ansara Law Firm today for your free initial consultation at (954) 761-4011.